LED lighting is becoming all the rage, from forward-thinking municipalities converting their traffic and street lighting to the efficiency of LED fixtures, right down to the desk lamp here on my desk. As LED lighting technology continues to make inroads into the common incandescent bulb, as well as LED’s green competitor the CFL bulb with its now easily recognizable tube-swirl design, LED’s are now making their move to replace the common fluorescent tube. But is LED tube lighting ready for commercialization? That’t the question Houston Neal at SoftwareAdvice.com takes on with an informative article on the pros and cons of fluorescent tubes vs. LED tubes. In the article there’s also a quick survey regarding public perception of the LED vs. fluorescent debate (a debate that is surprisingly contentious in some circles). The survey takes seconds (I took it), and is a good way to answer the question, at least in the public’s mind, if LED tubes are “ready for prime time”. LED's are ready for prime time. Yes you will be paying a lot more for LED lights and in the end the savings are not making that much of a difference, but in the long run as LEDs become more popular and CFL get pushed aside you will start to see the price of LEDs come down. I tell my clients if they are going to be in their home or office for 10 years then it is well worth investing in LEDs. signage, interior and exterior, can add impact, save money, and give more options from color changing to programmable the options are almost endless with LED's. I am all for eco friendly LED solutions, keep up the good work! 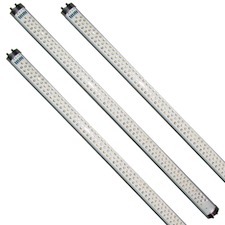 The led fluorescent lighting are very good to replace conventional fluorescent lights. save electric duties and good for environment.